Habitat: Plant is native to most of Europe and western Asia. It grows well on sandy, clay and nutritient-poor soils. Description: Evergreen climbing plant. It grows to 30 meters in length. Leaves are dark-green and waxy, alternately arranged along the stem. Ivy flowers from October to November. Flowers are produced in small, greenish-yellow umbels. Fruits are fleshy, purple black to orange yellow berries. Useful components: Saponins, glycosides, various organic acids and mineral compounds. 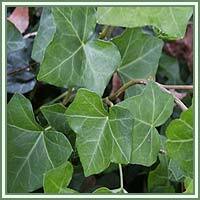 Medicinal use: Common Ivy is primarily used in treatments of respiratory conditions (dry cough, common cold, asthma and bronchitis). 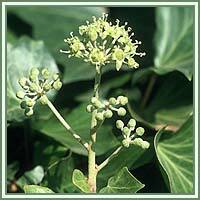 The plant extracts are used as antispasmodics and topical treatments of skin infections, itchings and sunburns. Recent studies have shown that Common Ivy displays antifugal properties, and that it can be toxic to some parasites and bacteria. Safety: The plant is said to be poisonous if taken in large doses. The leaves and fruits contain the saponic glycoside hederagenin which, if ingested, can cause breathing difficulties and coma. Due to the presence of polyacetylene compounds, the sap can cause dermatitis with blistering and inflammation.